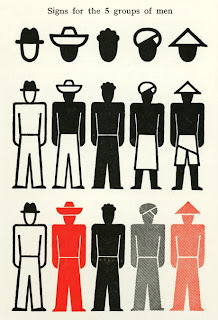 Otto Neurath was a designer/philosopher working in Vienna in the early 20th Century. His Universal Silhouettes form the basis for most of the ideographic wayfinding and information systems in the world today. He strove to achieve a "humanistic visual austerity" and claimed that "those who drew educational pictures as servants of the public and not as its masters" were superior in every way. He rejected Art for Art's sake. He attempted to develop a picture language as an alternative to written script. Paradoxically his ideas and work coincided with the development of a Universal spoken language, Esperanto.